Taste test: These are good chips with a wiggly shape and texture similar to kettle-cooked chips, but not quite, as they also have some of the moisture characteristics of chips cooked in soybean oil. They have a good crunch and lots of potato taste. There were a good number of large, unbroken chips in this bag. 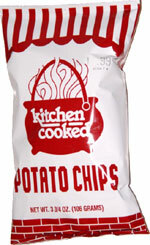 Smell test: Potatoey and kind of oily smell, a lot like other chips made with Soybean oil. This snack was discovered by Jeremy at Casey's General Store, Tremont, Illinois. Review published .